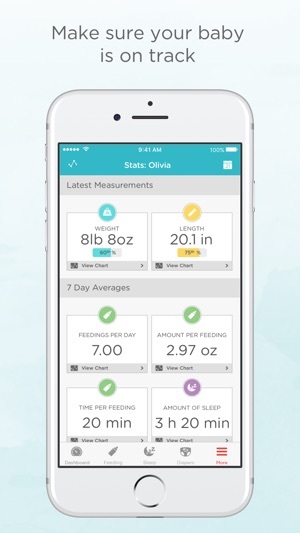 Hatch Baby--recipient of the prestigious Mom’s Choice Award--helps you track of all your baby’s most important growth and health data, including feedings, diaper changes, sleep, and much more. Get insight into your baby’s development with visual charts and understand your baby’s patterns with a convenient activity summary. Use the app on its own, or connect it with our award-winning Hatch Baby Grow or Smart Changing Pad--changing pad with built-in, wireless smart scale. Grow measures how much breast milk your baby is drinking at each feeding and automatically syncs to the Hatch Baby app. - Track breastfeeding or bottle sessions with an easy-to-use, one-tap timer, which allows you to adjust the start time if you forget to start the timer. - Conveniently pause the timer during nursing sessions to switch breasts and record the time for both sides. - Connect to Grow or the Smart Changing Pad (optional) to measure exactly how much your baby is eating at each breastfeeding session. 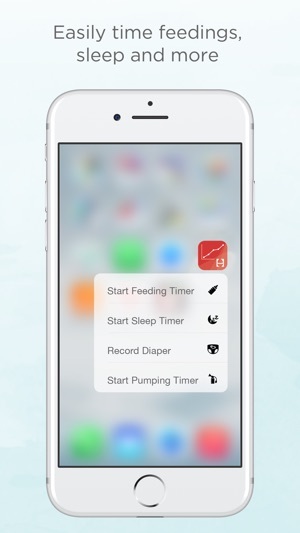 - Capture feeding session notes, like your baby’s formula preference. - View daily, weekly, or monthly summary charts to gain insight into your baby’s eating patterns. - Easily keep track of changes to ensure your baby is drinking enough throughout the day. - Record notes that can be shared with your pediatrician or other caregivers. - Connect to Grow or the Smart Changing Pad (optional) and automatically record diaper changes. - View daily, weekly, or monthly summary charts to gain insight into your baby’s diaper patterns. - Track naps and nighttime sleep with an easy-to-use sleep timer, which allows you to adjust the start time if you forget to start the timer. - Discover your baby's sleeping patterns to help her get the best rest. - View daily, weekly, or monthly summary charts to gain insight into your baby’s sleep patterns. 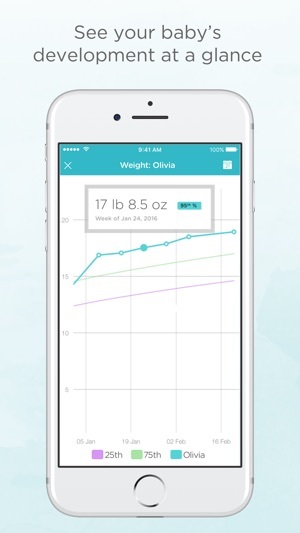 - Track your baby’s weight and length gain, and compare his growth percentile to worldwide (WHO) data. - See how your baby grows week-to-week. - Weigh your baby anytime or before and after feedings with Grow or the Smart Changing Pad (optional) and automatically send weights to the app. 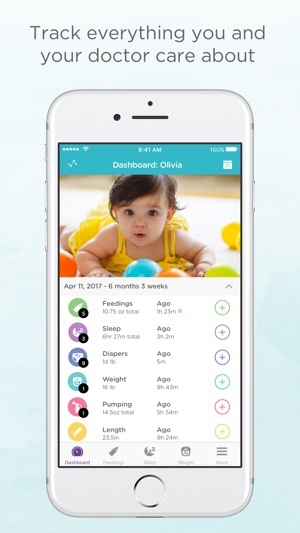 - Invite your partner or caregiver to share your baby’s account and record activity. - Receive updates from your baby’s caregiver while you are away, including when your baby last ate or slept. - Export and share your baby's data with your pediatrician or lactation consultant. - Access your baby’s information across multiple devices. - Track pumping sessions with an easy-to-use, one-tap timer. - Record amount, duration, and side(s) pumped. - View a convenient summary of your baby’s diaper count, feeding amount, and total sleep for the day, as well as Hatch Handbook articles providing parenting insights. - Scroll through a log of your baby’s recent activity. - Customize your dashboard to display the activities (i.e. feedings, diapers, and sleep) you track or view most frequently. - Take a photo of your baby every day, play the slideshow, and watch how your baby has grown! - Share photos with family and friends. 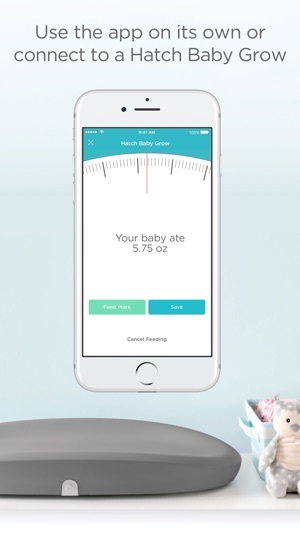 - Use the app on its own, or connect it with Hatch Baby Grow and Smart Changing Pad -- where changing pad meets connected smart scale to help track your baby’s weight gain and feeding amounts. - The Bluetooth-enabled scale measures and records how much your baby eats at each nursing session and syncs automatically with the Hatch Baby app. We love hearing from our customers so please drop us a note at support@hatchbaby.com. Also, check out Hatch Baby’s other app-enabled smart products at www.hatchbaby.com. We made some important updates to keep your app working properly! If you love the app, we’d be grateful for your review. If you have feedback or questions, we are here to help at support@hatchbaby.com (Seriously! Email us! We live for this!). Overall, I think this is a good start. My wife and I both use the app to track feedings and diapers for our daughter. We take shifts during the night, making sure to log if/when we did a feeding so that we don’t need to wake each other up to get that info when we change shifts. Unfortunately, most of the time, the app on one of our devices does not reflect events logged on the app on the other of our devices. This is sometimes remedied with some tinkering, such as a pull to refresh and/or backgrounding and reopening the app. But obviously the desired behavior is that a logged event on one device is instantly and automatically reflected on all devices logged in to the same account. I happen to be an iOS Software Engineer, so I am sympathetic to the challenges of providing a synchronized state across devices (particularly if you’re also relying on CoreData for your local store). My best guess is that you guys are waiting to post user changes to the server until either the modified table view will disappear, or the app enters the background. An update where that sync routine is triggered immediately following any modification would definitely get me to 5-stars on this app! Hi, sorry you're having issues getting your data synced up! Please reach out to us at support@hatchbaby.com and we'll get it squared away! While this is one of the more modern and clean looking baby apps lots of room for improvement. Very difficult for multiples since to switch between babies you would think you would simply tap the babies name to toggle between your babies since multiples will typically be eating, pooping and sleeping at similar times. Instead you have to click more button scroll to top, switch babies, then go back to the screen you were on for the other baby such as feeding. Hopefully this big oversight will be fixed so you can simply switch babies with one click of their name. Unlike other apps like Glow, you can’t track when your baby is sick, or medications, or vaccinations or appointments, temperature, etc. The plus button to add things like bowels, pee etc is a tiny plus in top right which is a big stretch on iPhone X. Those primary actions would be better as a floating circle button at bottom. The major glaring issue is the whole point of baby apps are for tracking so that you can export the data to pdf for doctor visits or others when needed. Currently there is a simple CSV export which not helpful at all compared to the leading baby apps such as Sprout which generates a beautiful PDF with relevant data based on what you need and charts etc. A key feature comes across as more of an after thought and I imagine why there are so few users since it’s such a pivotal feature. The app keeps crashing on my iPhone but works on ipad. I wish the pad had output directly on the pad without having to log into the app. Holding a baby, iPad and opening the app to get their weight is difficult. This may be a user issue, but I could never figure out where to go to see the actual weight when logging a feeding. It tells me how much he ate, but I also wanted to see the before and after weight. Also, I will log a weight entry and it won't appear immediately, even after refreshing and closing and reopening app. This product is still really helpful and I don't regret buying it, although I wish the weight increments were even more precise. I'd like to know when the quarter ounce increments bump to the next number. For example, if it's .49 ounces, is that rounded down to .25? This can make a big difference in feeding amount over the course of a day.